And I, like so many other new riders used to ride in a ‘big’ gear when I first started riding a road bike. It seems that when we start out we expect it to be hard to turn over the pedals so we tend to use a gear that challenges our legs. What you actually do is fatigue your legs and make it harder to ride long distances. Over time you learn to ‘spin’ your legs more and increase your cadence (pedal revolutions per minute) saving energy while still keeping up with the pack. The reason bikes have gears is so you can pedal (relatively) comfortably no matter what the terrain. Most bikes have two sets of gears – the front ones which are commonly called the chainrings, and the rear ones which are often called the cassette. For the purposes of this blog post I’m focusing on road bikes but many of the principals apply to other bike types. Current road bikes typically have two chainrings at the front and 11 cogs on the cassette at the rear. In basic terms, use the small ring for climbs and easy spinning on the flat, and the big ring for fast riding on the flat and downhill. In reality, it’s more intricate than that, but over time you’ll begin to learn what gear is best for the terrain. You will notice that moving the chain from the smallest rear cog to the largest eases your pedalling effort incrementally, sort of like fine tuning. While moving it between the chainrings in the front results in a much more noticeable change—pedalling feels easier in a smaller chainring and harder in a bigger one. An important skill to master is changing gears effectively on a climb. Short steep rises in the road can sometimes be attacked without having to change gear, but if you see a big hill coming up, or a significant change in gradient, it’s best to be prepared and get into a low gear early. This means looking up the road and changing gear in advance. This applies on the flat, too. For instance, when coming to a stop, click down a couple of gears so you can move away easily again, rather than having to heave the bike back up to speed. You’ll move away quicker and your legs will thank you for it. If you do need to change gear when climbing, ease off on the pedals to the point where you are almost freewheeling before you change gear. Derailleur gears work by forcing the chain to move across sprockets, so easing off the torque you’re applying through the pedals before you shift helps to relieve the stresses involved. Changing gear while standing up out of the saddle and mashing the pedals will at best result in a terrible crunching noise, and worse still a snapped chain or derailleur damage. You may have heard the word trim used in connection with shifting, or you may have even done it accidentally while shifting, but never knew the name for it. Trimming is an important skill to have when you access the gears in the extremes of your bike’s range. 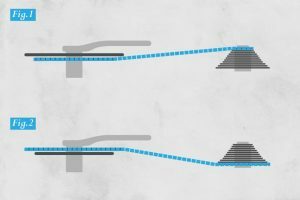 The trim function is essentially a ‘microshift’ or ‘half-shift’ because it moves the front derailleur ever so slightly without moving the chain off the chainring like a full or regular shift. Different shifters have slightly different trim functions but on a Shimano shifter you use the left shifter to control the front derailleur, and to trim the gears you simply click it a second time but softer that a whole change. Practice it next time you’re riding your bike. Cross-chaining occurs when you put your gears in either of the extremes – the biggest cog and big chainring or smallest cog and small chainring, and it’s something you should avoid. Cross-chaining puts quite a lot of stress on your chain and gears, can lead to a noisy, squeaky drive-train (chain rubbing against the inside plate of the front derailleur, for example), and causes your chain to wear quicker. 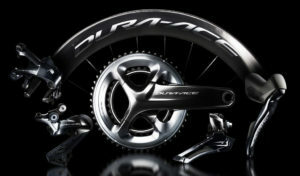 Quicker chain wear then leads to quicker cassette wear, and quicker chainring wear. It’s not a big deal if you find yourself in this combination occasionally, but don’t make a habit of it. Like all other bike skills and just about anything you do practice is the key to mastering efficient gear changing on your road bike. Go out on your own and ride around changing gears more frequently than you need just to get a feel for the gears. Another way to practice is to set your bike up on an indoor trainer and change gear over and over. And also like many other skills, mimic what other more experienced riders are doing around you. It’s pretty easy to glance down at another rider’s gears and see what gear they are using and you can also hear/see when they change. What have you learnt about changing gears on your road bike? Share your experiences via comments or the Women Who Cycle Facebook page.